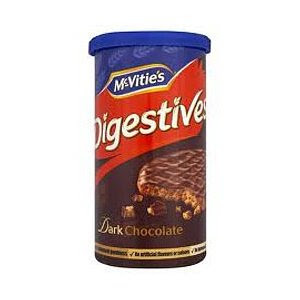 I’ve come across “digestives” in the Betty Neels books I’ve read and finally today I looked up what it was. They’re cracker-like cookies called “biscuits” in the UK although they’re nothing like Southern-style biscuits. I had read about chocolate digestives and decided to try some, and lo and behold, Amazon has them. So I bought some. I am about to embark on some British culture, folks. :) I hear they’re fantastic. The milk chocolate digestives are the most popular but I couldn’t resist getting these dark chocolate digestive biscuits. And according to Wikipedia, they’re called “digestives” because originally they were thought to have antacid properties due to the sodium bicarbonate used to make them. I think these days, the ingredients make them a decent source of fiber. Anyone had these before? I just hope the weather stays cold so they won’t melt before I get them. Yum-mo! Digestive cookies seem to be very popular in Asia too. I've seen quite a few recipes using these cookies. But now I finally know *why* it's *digestive*. ha ha. Wonder if you can find them at Cost Plus World Market? I didn't know they were popular in Asia, too! I can't wait to try these! Ooooooh I LOVE EPCOT!! I would love to go back! I am breaking into my Vibram Five Finger shoes slowly and hope to get up to marathon distance by the end of the year, so maybe I'll be able to go to the Disneyworld Marathon in 2013 or 2014!